San Marcos business owners, we have a way to make your business more productive – are you interested? 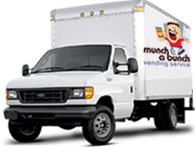 Munch a Bunch Vending in San Marcos offers the best in full service vending, coffee services and water delivery. You can stop employees from running to the local coffee shop or convenience store by bringing the products they crave right to the office. Your San Marcos employees will spend more time relaxing on their breaks while still having access to all of the snacks, foods, and drinks that keep them focused throughout the day. We give you hundreds of options for vending machines, including: Pepsi Cola vending machines, Coca Cola vending machines, snack vending machines, coffee, hot/cold or frozen foods, healthy foods and beverages and candy vending machines. In addition to the basics, we also have other options like free vending, subsidized vending and Micro Markets. 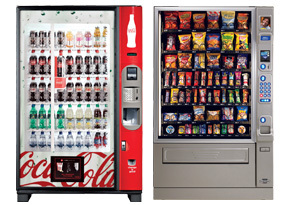 Our vending machines are modern, dependable and energy efficient. We consistently stock them with a huge selection of delicious, name brand products. In San Marcos, we will install your vending machines, fill them, keep them full and clean and service them at no cost to you. Make getting a cup of coffee a hassle free experience. With Munch a Bunch Vending there will be no more fighting over who gets to choose the next pot and no outdated equipment. We'll take care of everything in your break room and keep the shelves filled with all your favorites! Name brand coffees, new equipment like a single cup brewers and all the condiments too. We'll keep your break room filled with cups, napkins, paper towels, utensils, creamers, sweeteners, plates, and stir sticks. This eliminates wasted time running out for a refreshing cup of coffee. Munch a Bunch Vending also does plumbed in water filtration units. Have a fresh, crisp, clear cup of hot or cold water whenever you want one. Contact Munch a Bunch Vending today at 760-480-0870 or mabvending@yahoo.com.